Capturing the essence of an experience, The Orphan Brigade has re-assembled to once again bring the spiritual to life. This time they have left the New World of Octagon Hall Kentucky and taken their tunes of discovery to the Old World, or to be more precise: the caves beneath the town of Osimo on Italy’s Adriatic coast. What has been repeated though is the knack of absorbing a moving experience and re-creating its effects in song and music. The true test of this type of project is, does it cross the line to convey the emotion to the listener? This can only be truly answered on an individual basis, but there is sufficient craft, guile and panache in The Orphan Brigade project to present a compelling case. Essentially, now that the Nashville based trio and band core of Ben Glover, Joshua Britt and Neilson Hubbard have re-convened for a second recording, the term ‘project’ can possibly be dropped. However, such is the concept nature of HEART OF THE CAVE, you can only appreciate the depth each artist went, to put their experience to art. This is a fairly intense album, unlocking the trapped potential of a mystical and spiritual world. The fact that the musicianship and song writing is first class has helped considerably to tell the subterranean stories that were inventively mined through personal experience and accessing astute local authority. The trio made a return visit to write and record the songs in Osimo, thus ensuring every ounce of atmosphere went unfiltered into the album. Of course, studio producing in Nashville tailored it for a contained audience experience and a willing label in At The Helm records has been suitably impressed to release the album in the UK. A major pause for thought when assessing the album is to what extent the accompanying background story and information becomes essential to grasping the record. Maybe, it is a precursor to maximising its value and likewise to the previous record – SOUNDTRACK TO A GHOST STORY – extensive details were at hand during the review process. Accessing this information is still highly recommended, although casual observers aren’t precluded, purely on the grounds of how the record has been produced for the listener. It helps that three of the most accessible tracks appear early on the album, thus enticing the listener to hang in even when a touch of stamina is required in the latter stages. Of the three tracks, the roots chanting stomper ‘Pile of Bones’ inverts the opening role by taking the listener to the ultimate end of life (unless anyone knows different!). This is closely followed by a more conventional scene setter in ‘Town of a Hundred Churches’, with its popular structure. ‘Flying Joe’ has emerged as a catchy singalong story of a 17th century Friar with a capacity to levitate. A tune that immediately stuck when Ben Glover previewed a few of the songs while visiting the UK earlier this year. HEART OF THE CAVE is definitely a shared project with all three main protagonists getting the writing credit across the board. Local historian Simona Palombarani helped on ‘Pain is Gone’ alongside furnishing the project with numerous invaluable stories associated with the caves. There are also various other celebrated contributors in the extended Orphan Brigade family such as Gretchen Peters, Barry Walsh and Will Kimbrough. As the album progresses, it does spread its emotional wings from the magical chants surrounding ‘Alchemy’, through the upbeat ‘The Bells are Ringing’ to the powerful ‘The Birds are Silent’ and the haunting ‘Meet Me in the Shadows’. There is so much more to discover in these songs and as previously stated, check out the comprehensive blurb either online or likely within the packaged liner. The ultimate value in HEART OF THE CAVE is its ability to both educate and entertain in similar proportion. Folk music has been an important tool in disseminating learning over the centuries and you can view this record as an important archive for the 21st century putting down its marker in the long lineage of history through song. 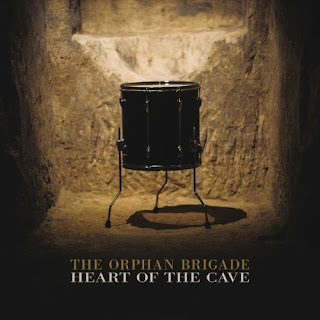 From a sound perspective, The Orphan Brigade has added an Americana coating to a slice of European history. When it is done this well, the winner is the listener.